As you walk in this Universe, you will find some striking similarities with others games. 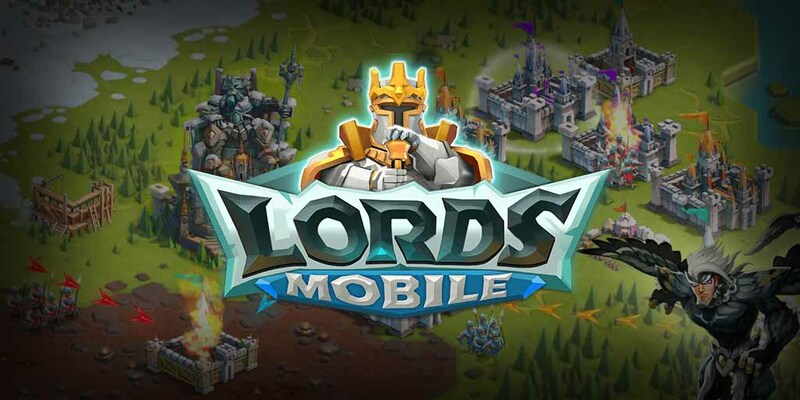 When you first login in this game, you will have a brief tutorial, that will explain you the basics elements you need to know in order to start playing the game. As the walkthrough finishes, you find yourself alone, in a hostile kingdom (for dramatic purposes) but glad you have a shield on, so nobody will attack you right away. What should you do now? First, familiarize yourself with your surrounding. Do not under any circumstances lunch an attack during the first hours of your gameplay. You have a shield, use it wisely. Try to level up all your buildings till you can unlock the shelter. This feature will help you greatly since it will allow you to secure your leader and your troops [from c2 up to c16, if your leader is capture he will escape after X amount of time*]. *This doesn't mean that your troops will be safe. In case of an attack, your troops will go to the infirmaries. However, if you have more troops than what your infirmary can hold, then you will have dead troops on your end. Once you've familiarised yourself with your surroundings, join a guild as soon as possible (being alone especially when starting in the game leaves you vulnerable to attacks). After that, train some troops, enough to beat the first few skirmishes. The first troops that you have available are tier 1 troops. The first 2 skirmishes you'll be able to get through with the initial troops that are given to you as you start the game. Further on, you'll need higher tier troops (not compulsory though, but there will be sacrifices to make). Indeed, the troops 80% ish of the troops are saved when you are trying to unlock the skirmishes, the rest is lost. Each skirmish offers you a previous of what's inside. Indeed, as you scout them, you can see the number of troops it has and if there are any boost or not (mainly the last 2 skirmishes). Even if it's a bit too early to talk about this, the scout will provide you with an overview of what the skirmish has inside. Troops have a way of working inside this game (and many others am sure of it). You’ll have 4 different types of troops: infantry, ranged, cavalry and siege troops and each of them can be defeated: infantry is countered by cavalry, ranged is countered by infantry, the cavalry is countered by ranged, the siege is countered by all troops. Simplifiying this it would give: infantry > ranged > cavalry > infantry. When you scout those skirmishes, check out what it has and send a counter team, this way you'll lose fewer troops and have more chances of defeating them more efficiently. Once the first skirmishes are over, you'll need to build your main resource buildings (ore, lumber mill, mine, and farm), the academy, and the workshop (the other buildings you will unlock them as you advance in the game). 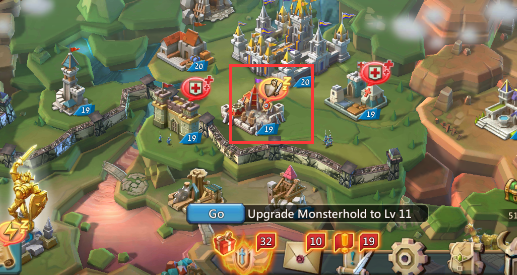 Once those buildings are done, start upgrading them to the same level of your castle. You’ll realize that all the buildings are related to one another, so to upgrade the castle to the next level, you need to upgrade the other buildings first. – At this stage focus, on our research. Your priority should be on the economy and military tab (max them all till you reach the limit imposed by your academy), then monster hunt (the higher this research is, the better it is). Also, train troops since they will help you to gather resources (ore, wood, stones, gold). [If you'll become a trap further on in the game, only focus on the main buildings to get your castle up to 25 and military research, the rest is extra might that you don't need since your goal is to keep your might as low as possible in order to become an appealing target for higher might to hit]. – Don't train huge amounts of troops, it's too early to do so. You should have as many troops, as your shelter can hold (if you trained more, the excess should be cover by your infirmaries). – As you unlock Skirmish 3 and 5, build manors and infirmaries. The manors will not only provide you with gold, but they will also give you a training boost. – Hero chapters. The first chapter is pretty easy and as you go through you'll unlock new heroes (Prima Donna, Sage of storm, etc). After this phase is done, you'll unlock heroes and upgrade those you have (and will get, except for the "pay to play" heroes) in the "elite" chapter. – Increase your VIP level up to level 8, as soon as possible. Otherwise, you'll have to manually do all the admin and guild scroll quest and patiently wait for the timer to run out. – Save your gems up to 10k. As you move along in the game, you'll unlock skirmish 8 and with that, you'll be able to build the treasure trove. Deposit your gems there and every 30 days, it's payday. The more you can deposit in there, the more gems you get (for that you'll need to upgrade the building, it requires a special item "crystal pickaxe", or improve your research).